LSE – to the future and beyond! The London School of Economics and Political Science has always been a small institution with a big name. Although considerably smaller in student numbers, faculty and size of estate, it has usually punched above its weight. It does all this from a cramped corner of central London. Some of its buildings have seen better days, but in recent years there has been a push to a new campus that will become a landmark for learning in the capital. With some of the component elements now in place and others secured, this post takes an unashamedly geeky look at LSE’s growth – past, present and future. When I was a student at LSE, campus life was focused on Houghton Street. The School had just closed its library for a major refurbishment and was temporarily renting the former Patent Office and latterly the British Library’s Science Reference Library – 25 Southampton Buildings. The School had some flagship real estate, with the Hong Kong Theatre and Clement House providing up to date teaching space. The LSE’s Director publicly acknowledged that the estate was in poor shape, noting that: ‘the LSE campus has been so poor for many years’. This would be tackled over the coming decade, fuelled by the successful £100 million fundraising drive in the Campaign for LSE. The first major redeveloped space would see the reopening of the British Library of Political and Economic Science (BLPES). 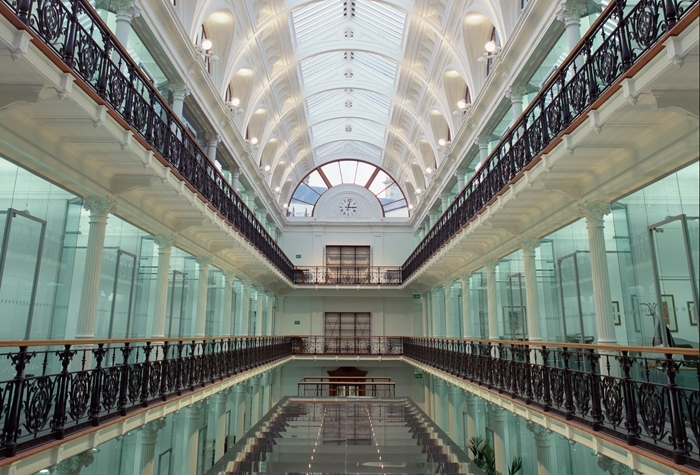 BLPES returned to an internally unrecognisable Lionel Robbins Building in 2001 after the building had been refurbished in a project overseen by Sir Norman Foster. With the redevelopment of the BLPES complete, LSE could now move on to its next major project. In 2003, it announced the purchase of the former Public Trusteeship building at 24 Kingsway. Five years later, the LSE would open the New Academic Building, adding a substantial 120,000 square feet (11,000 m2) to the size of the campus. The New Academic Building created four new lecture theatres and 16 seminar rooms along with accommodation for the law and management departments. LSE signalled its commitment to shifting the centre of campus gravity to Lincoln’s Inn Fields with its acquisition of the former Land Registry building in the south-west corner of the square. Purchased in 2010, the building opened as the home of the LSE’s department of economics and several other research centres and provided additional modern teaching space. The LSE also bought the freehold of and refurbished Sardinia House, close to the square. Meanwhile, the St Philips Buildings were demolished to make way for the first new building on LSE’s campus for 40 years. They would be replaced by a starkly angular and striking brick building housing all student services under one roof. Named for a large donor, the Saw Swee Hock Student Centre opened this week (January 2014) to provide new homes for the LSE Students’ Union and its Three Tuns public house, the LSE venue, gym, cafe, media centre (for The Beaver newspaper, PuLSE radio, LooSE TV and the Clare Market Review) and student union offices. The building is an incredible leap forwards for LSE’s students. It had been thoughtfully designed to maximise space to meet, eat, study and play. I suspect the rooftop terrace and cafe will be incredibly popular, especially on sunny days. It was heartening to see how many students were using and exploring the building on the first day of term. So where next for the LSE? In the immediate future, a bit of tidying up around the Saw Swee Hock Student Centre – extending pedestrianisation and improving the street scape throughout the campus. But perhaps the biggest changes are yet to come. Another academic development, the Francis Crick Institute behind the British Library, will see Cancer Research UK leave its 44 Lincoln’s Inn site, allowing LSE to almost complete its acquisition of the south side of the square (only the The Royal College of Surgeons will be left between LSE holdings). Not only will this make a substantial addition to LSE’s teaching, research and office space, it will be a critical conduit between the Lionel Robbins Building, the Saw Swee Hock Student Centre and Houghton Street and Lincoln’s Inn Fields. With the New Academic Building, 32 Lincoln’s Inn Fields, 44 Lincoln’s Inn Fields, the Peacock Theatre and Sardinia House, LSE now has a clear presence occupying the south and western sides of the square. Perhaps the biggest change will be, appropriately enough, back on Houghton Street. With the Saw Swee Hock Student Centre replacing the LSE Student Union’s old locations in the East Building and Clare Market Building, the wholesale redevelopment of the centre of the LSE’s campus is now a possibility. It is one that has been embraced wholeheartedly, with the LSE asking RIBA to host a competition of architects for the project. The winners, Rogers Stirk Harbour + Partners, put forward a bold proposal that will see a new public space at the heart of the development. (the missing proposal was the result of a practice dropping out of the competition). See also this Architects’ Journal piece on the competition.